Extravagant dining in a rustic setting. Joy, a Park City native, says, “It’s an emotional, fun thing for me to come back [after being located at Canyons]. I’ve skied here since I was 5. Geir and I were the very first wedding on the peak. We raised our children up here. We’re just thrilled.” The move came during Canyons’ reorganization. “It’s a natural thing for any business to renew itself, and I think people appreciate that,” Geir says. Though day skiers can enjoy lunch, evening dining remains the main attraction. A snowcat-pulled sleigh leaves the resort base at 6 p.m. for a 25-minute ride gaining 1,000 vertical feet. The city lights twinkle as the sun sets over mountains. At the top, a blazing wood stove, homey lighting, a baby grand piano and wood accents bring the yurt to life—romantic indeed. Patrons are welcomed with hot glogg—a Norwegian berry-based beverage—before the chef introduces the evening’s meal. The first course is a soup, followed by salad, then a Kobe beef entree. The sorbet palate cleanser is served in rock dishes that Joy brought back from Norway. The cheese course is served on an aspen plank and, finally, blueberry cardamom bread pudding finishes the six courses. 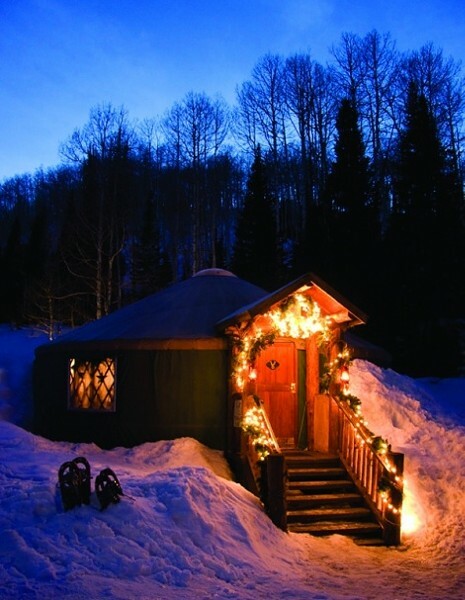 The 4 1/2 hour dinner and unforgettable evening end with a sleighride down the moonlit slopes under the stars.